Good morning! 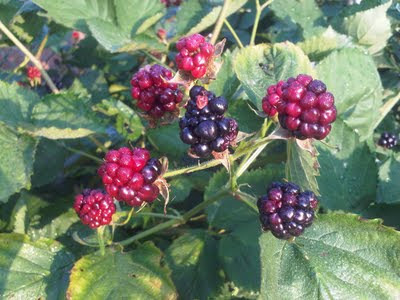 My blackberries have been taking their sweet time this summer and they're finally beginning to ripen. It's great to be able to walk out back and grab a few fresh berries to enjoy with my breakfast. What is difficult to show you here with this photo is their size; each berry is approximately 2 inches across! Do you have a great recipe including blackberries?